In 1974, at the beginning of my working life, I joined something called a “co-operative” , based in Kentish Town. It was run by an elderly (we thought so anyway – he was in his 30’s) American gentleman who described himself as a Maoist. He paid University graduates £6 per week – but only if they needed it. No stamp no pension no holiday pay, real communism in action. He spent the day reinventing the world and we challenged it by debating, for example, whether it was acceptable for us to have our own clothes or whether a communal wardrobe might make life fairer. We thought we stood for life and liberty, but were really just another bunch of neo-puritans arrogant enough to think we could tell everyone else how to live.It was during that brief era of alternative careers. Camden Council had moved the entire working class of Kentish Town out of their homes to build them smart new flats. The council subsequently discovered it didn’t have the money to do it and so had a load of empty property on its hands. Afraid of being squatted, it let houses go at a “peppercorn” rent to anyone who’d keep a building locked up and maintained. Terrible for ratepayers but who cared? We moved in, so did all sorts of other alternative types including purveyors of alternative food. Just down the road from us was an “alternative” wholefood snack bar selling fashionable grey slabs of brown rice, lentils and barley, all cooked we were told with “kindness”, though how you can boil anything kindly defeats me. We were served by a person with yellowing skin and incipient herpes scarcely recovered from last night’s binge and trailing an unhappy two year old plastered with dirt and grease from a shop floor that smelled faintly of mice. In the shop window was a tray of Carob cake, touted as the “alternative” to chocolate which, we were told was “evil”. Don’t ask me why. I was pruning our lovely Carob tree yesterday and all this came back to me, though I doubt the north London junkies ever knew where any of their their powders came from. The carob is a true native tree, not just to Spain but of the entire Mediterranean coast. It can grow right down to the seaside being salt tolerant. It thrives on drought, loves rocky terrain and will spring up to thirty feet high while your back is turned. 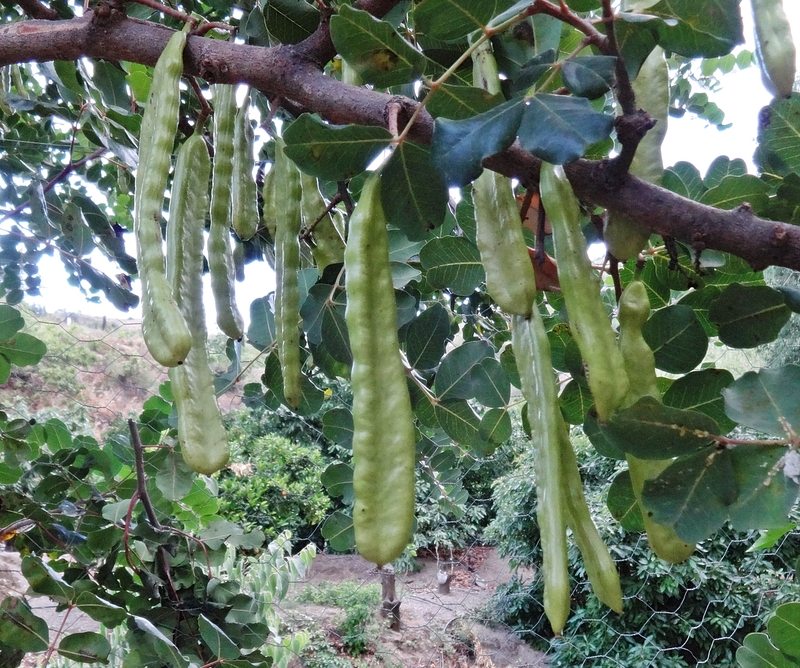 I looked up to see its great shiny pods – hundreds of them among leathery glossy evergreen leaves that burn poorly and make the Carob tree the foresters’ choice when planting firebreaks in mountain forests. 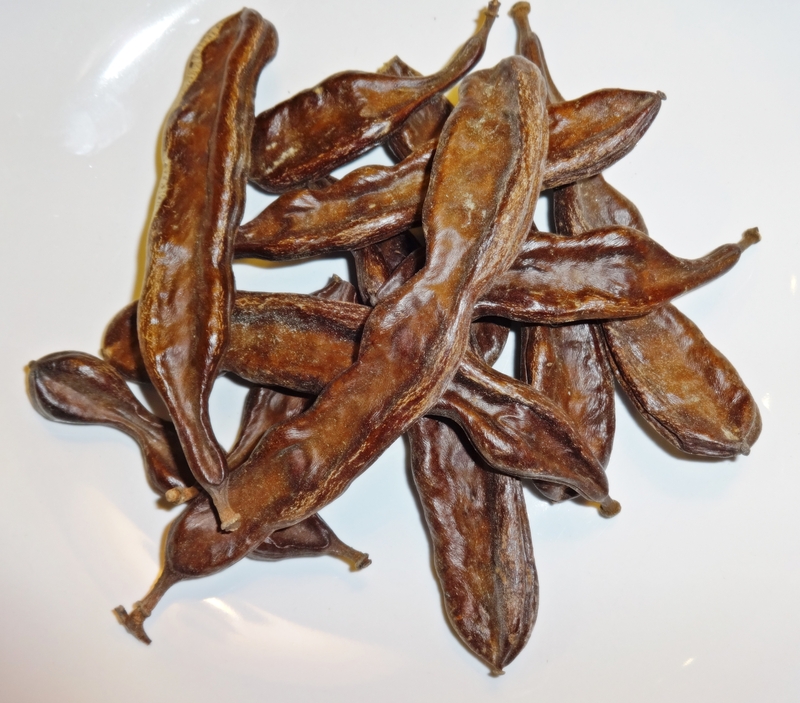 Each carob pod contains a sweet pulp and several bean-like seeds. You eat the pod not the seeds, though the seeds have their use, being absolutely uniform in size and shape. This made them useful as a measurement of weight in antiquity. The word for “carob seed” in Greek kerátion(κεράτιον), evolves into the Arabic qīrāṭ (قيراط), which in the mid 15th century English becomes “carat” the unit measure for gold! Get it? Ground up Carob pod, raw or roasted is a very fine food, though its reputation has suffered partly because it is sold in “health food” shops as a substitute for chocolate. It is no more like chocolate than chicory is like coffee. It has its own flavour, more akin to caramel than chocolate, especially when roasted. Carob is also denigrated because here in Spain it was always the food of the poor peasant, resorted to in times of famine. Spanish farmers now feed it to their donkeys. Last year some enterprising mid European workers asked us and our neighbours for the right to glean the pods for animal food. Processed and sometimes roasted and ground to a powder for human consumption it is quite expensive though you may think as I do that that life is too short to pick the pods, boil them, split them to take out the seeds, dry and roast them before pulverising them in a coffee grinder. Bought or home made, carob is one of the finest and healthiest forms of sugar you can eat. The sugar content can be higher than 50 percent in varieties harvested for direct human consumption. Carob contains 7 to 16 percent glucose or simple sugar and 7 to 16 percent fructose or fruit sugar. It also contains 50 to 70 percent sucrose, which is like table sugar. The great difference between serving refined sugar and carob sugar is that carob is very rich in fibre and this slows the absorption into the bloodstream as well as contributing to a high fibre diet, making it a heart-healthy ingredient that can benefit your cardiovascular and digestive systems. One of the components of carob fibre is Pinitol, which has been shown to regulate blood glucose and therefore has potential value for diabetics. Carob flour has 41 grams of fiber per American cup — 2.4 grams per English tablespoon. To assess the difference between commercial sugar and carob sugar it’s useful to look at their position on the Glycemic Index. This tells you the speed with which sugar is absorbed into the blood stream. The quicker the absorption the worse the food is for you and the crankier the person eating it, because it produces a spike of high energy that suddenly goes out, leaving a depressive under energised person behind. The higher the GI number the quicker the absorption and the worse the food. Glucose syrup scores 100, carob powder scores 15. Its worth mentioning micro nutrition in connecting with Carob – those ingredients which, occurring in miniscule quantities have created “wonder foods” out of fruit such as as pomegranate among the fashionably inclined urban middle classes. In 100 grams of carob flour there are about 200 milligrams of flavonoids and flavanols, which have anti inflammatory and anti oxidant functions in the body. They are supposed to benefit circulation and aid the burning of body fat. If you want to buy carob flour and try it on your family before you discover that the public has read this, bought all the carob and put the price up, you can flavour milk with it, or add it to breakfast cereal or bake with it. It is useful wherever sugar, especially added sugar is required, though you will need more than if you used commercial sugar. Or what about the inevitable breakfast bar get say 100 grams of almonds, chopped 300grams of whole oats and 50 grams of sesame seeds. Roast them golden and let them cool. Then finely chop up 150 grams each of best Axarqian moscatel raisins and the same of best Axarquian figs. Add three or four tablespoons of carob flour and mix in enough softened butter to bind. Taste for sweetness and add a little honey if necessary. Press into a square pan and put in the fridge to set. Cut into fingers. Something like that!! I love your description of the ‘alternative’ wholefood snack bar – mice, herpes ,yellowing skin and grey slabs of rice cooked with ‘kindness’…. But health and safety aside, thanks to your wonderful way with words, you have managed to convince me to give carob another go. I’m guessing that it’s not a Mercadona staple? so I’ll have a look for it next time I’m in the health food shop or at the market. Good for you Lottie. Thanks for dropping by!